Varsity o Sooth Dakota, B.A. 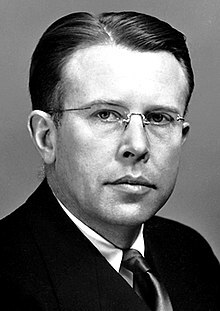 Ernest Orlando Lawrence (August 8, 1901 – August 27, 1958) wis a pioneerin American nuclear scientist an winner o the Nobel Prize in Pheesics in 1939 for his invention o the cyclotron. This page wis last eeditit on 10 August 2017, at 01:49.